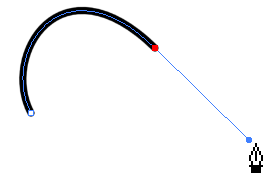 The Polyline tool is used to draw shapes. It is a central vector type of line. To form a shape, you click to add a point and then, without releasing the mouse, pull the handle in the desired direction before adding the next point and repeat the operation. To edit the shape, you can use the Contour Editor tool. 1. In the Timeline view, select the cell where you want to draw. 2. In the Tools toolbar, select the Polyline tool or press [Alt] + [_]. 3. 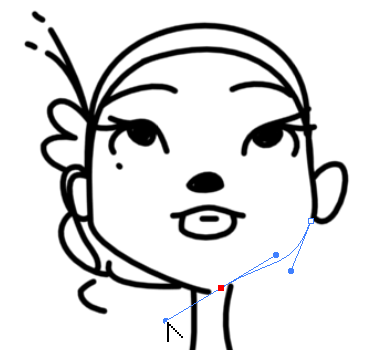 In the Camera view, click and drag your mouse to create a point and a Bezier handle to shape your line. ‣ Press [Alt] to pull only one handle, instead of two. ‣ Press [Shift] to snap the handles to 45, 90, or 180 degrees. 4. 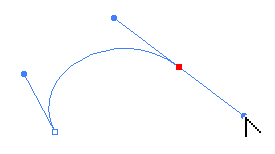 Click again into a new area and drag the mouse to create a second point and Bezier handle. 5. Repeat the previous step until your shape is completed. 6. Press [Ctrl] (Windows/Linux) or [⌘] (Mac OS X) and click to release the Polyline tool from the current path or shape that it is creating. Continue to use the tool to make multiple, independent paths or shapes. 7. If necessary, reshape the lines using the Contour Editor tool. Refer to Reshaping a Drawing Using the Contour Editor Tool to learn more about the Contour Editor tool.